Every Thursday I head over to my friend Brian’s house. For a while we were filming a show called SteamDads. It was a science based show that we enjoyed at first but really ran out of steam once we stopped coming up with experiments and ideas. It was fun to shoot but took a long time and didn’t really find much of an audience. Brian asked me if I wanted to help him out and film an episode of his show, Built from Bricks. I agreed and it has been fun ever since. We’ve done all sorts of shows. The most popular show has been the City Updates. Brian has such a cool LEGO City being built in his garage. Each week he has something new happening and it is awesome. Tonight we shot a whole behind the scenes video that included a studio tour. The photo from today was what I shot for our Thumbnail for the episode. You can watch it below. If you haven’t already, please subscribe. We are closing in on 100 subscribers and when that happens we are going to do a big giveaway. Brian even agreed to help me out with an episode of Big Damn Kid. 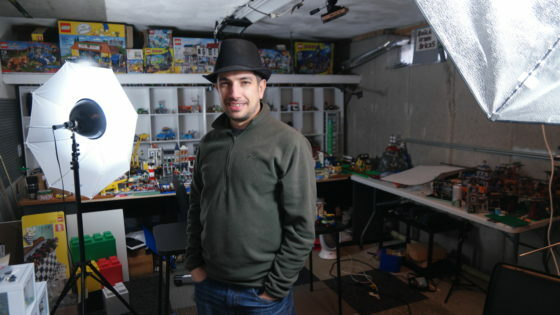 I’m looking forward to going to Philly Brickfest Live with him in April. I think people are going to love the MOCS he made for his LEGO City.